I am struggling to find any clues as to where this walking picture was taken. The camera is obviously very close on the pavement to the two young women, one of whom looks very puzzled as to what is going on. It looks like a parade of shops perhaps leading down to the beach, and some of the architectural features to me have the feel of a South Coast town like Brighton. Beret’s were obvious in fashion that summer at any rate. If anything rings a bell do let me know! It’s always good to see Sunny Snaps walkies as the firm’s history remains a bit of a mystery, so each identified example helps build up the story (and also dates the fashions nicely!). This pair were sent to me by John Thompson, who was trying to identify the locations. The 1937 walkie was taken on Worthing sea-front promenade, and was a popular spot with cameramen for some years before World War 2. The array of buses shows why! I also have a walking picture taken at exactly the same location as the 1938 Sunny Snap, which we know was South Street. John knows the people are his family and is now trying to find out exactly who they are. There is more on the site if you search for Sunny Snaps and more from Worthing in particular with a link to the firm’s story, and more in the book Go Home On A Postcard. The walking picture photographers in the Margate area were some of the busiest in the country, but also took some of the best portraits. This happy looking young couple are walking, albeit very slowly, seemingly transfixed by the camera. What really makes the image for me however is the woman to the right, not intended to be part of the portrait but captured looking back as she carries on, checking to see what has caught the eye of the photographer. The card is not identified but a quite look through Margate cards in the archive showed a match for the round headed windows in the building behind them. This was on Palm Bay, in the Cliftonville area of Margate, one of the most popular with tourists in the pre-war years. Remarkably the building survives and is now a cafe. The old postcard shows it in relation to the rest of the area at the time. Again looking at other examples, a date of around 1930 can be pinned on the card. Note the reference number scratched into the negative bottom left. There is no firm identified on the card back but it is likely to be one of the Sunbeam affiliates. Cloth caps and bonnets on! This is a frame originally one of three in sequence, taken on a converted movie camera on a tripod. The Mum and her son seem amused to realise they were being snapped, and even though the end print is very unsharp and there are negative scratches, they have purchased it later that day (and later cut it up into 2″ by 3″ frames). Everyone seems well wrapped up and it has been raining, but that doesn’t seem to have put off the crowds walking down the Tower Esplanade in Skegness (you can just about make out the tower in the background) so lots of potential customers for the photographer. The print is also helpful as it has been dated in pen on the negative at the side, 4.X.32. This may mean Oct 4th. 1932, if so quite late for a break. There are a few from the same family’s collection surviving in those I found, most seem to be Skegness. There are more Skegness images on the site if you use the search button (the post below is a set taken there). I don’t know who took this one, but the biggest firm in the town were Wrates, you can read about them on the site as well. I do like this pier walkie, but so far the location has eluded me. The gentleman is looking a bit suspiciously at the camera, but must have bought the print, which I think is a frame cut off a strip. Date wise it looks to be early 1930s, and there is a poster propped up advertising Clapham and Dwyer, a vaguely amusing comedy duo I’d not heard of before who were popular in the late twenties and into the thirties, perhaps appearing at the end of the pier show. There’s a group of people by the turnstile buying tickets to get on the pier, many had a small admission charge before the war to keep a little exclusivity to the site (sadly Wentworth Gardens have had to impose a £1.50p fee recently due to some people damaging the site, nothing changes). There are some nice bits of street furniture about too, the wheeled container and Pratts Oil dispenser would fetch a small fortune today at a salvage yard. Let me know if the location rings a bell. The Drummond Road sign places this walking picture in Skegness, and we’ve mentioned the Osbert Walking Picture sign here before too (you can read more about the firm using the link below). It was sent in by Ian Crick, and the photo shows his Grandmother Edith, plus his Dad Brian and sister Doris. The cameraman has been working quite quickly here, the focus is a little out and the boy in the cap obscuring some of the view is not one of the family. Brian is wearing reins, not something you see much on children today but very useful in a busy street, and also spats. Ian dates this to around 1936 (the horse and cart in the background suggests older, but they did trips around the prom for visitors until after the War), and he remembers hearing of the family trips to Skegness from their home town of Corby in Northants. Edith is carrying a nice wicker basket. She would find herself trending as the Times have just featured these on their fashion pages 80 years on! Although this walkie carries no identifying details, it is a half postcard size print with a miniature postcard style back print. One of the few firms to do this were Walkie Snaps of Blackpool, who sold two identical prints this size to customers. There is dirt on the negative and a scratch down the film too, evidence of hasty processing. The large building in the distance looked familiar and the Olympia sign just visible confirmed it as Blackpool. The Winter Gardens block survives and has a large exhibition venue inside called The Olympia. The scene is full of everyday incident, people out shipping, stopping for a chat, and various vintage delivery trucks. It has a pre-War feel about it, so probably late 1930s. The couple are fascinating, with the gent’s open necked vest at odds with the usual dress standards of the day (an open collar buttoned v-neck top perhaps). But then he probably figured they were off to the beach for a sit and a read of the paper, so what the heck. His solid build and direct look at the camera does suggest you wouldn’t want to argue the toss with him! The part of Adelaide Street they are on has now gone, replaced by yet another bland shopping mall of some sort (the Houndshill Centre – I looked it up), so where you could once walk straight down to the sea-front from the many guest houses, your way is now blocked by this and service car-parks. A bit of sensible town planning could have opened up a generous parade down to the tower and promenade. You can get an idea of the location by comparing it with the modern day street view above. 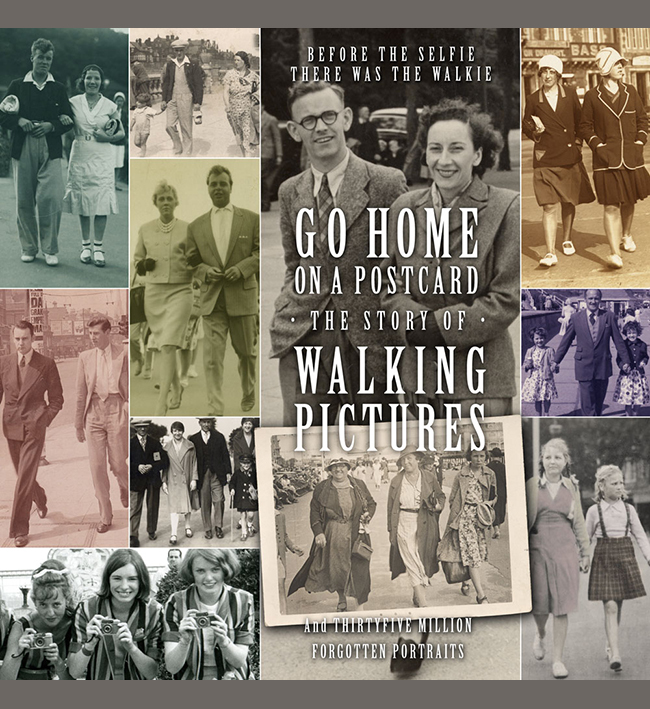 What we know about Walkie Snaps’ history is on the site and there are more examples of their work in the Go Home On A Postcard book.